Discussion in 'Amps and Cabs' started by mikeyfam, May 10, 2016. 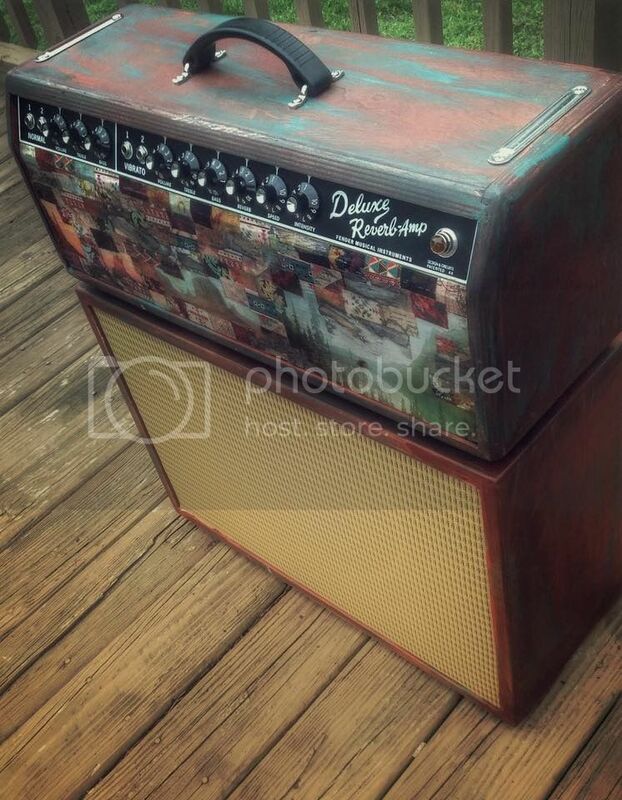 My friend at Islander Guitars in VA built me the cab. It has a Celestion Gold in it. Just refinished and swapped the tubes in the head. Sounds incredible and super portable. In love at the moment. axelfoley, dougb415, p.snail and 8 others like this. Nice set up! Tell us more about the head. I bought the head brand new from Sweetwater as a scratch and dent item. I hit up Eurotubes and bought the gold pin kit from them. I pulled the tolex off and stained it orange, painted streaks of blue, sanded it down, and finished it with an antiquing glaze. My girlfriend decoupaged a custom cut piece of wood which replaced the grill cloth. I biased it myself. It sounds great. The Celestion gold and Deluxe are a great combo. Awesome. I'm a big fan of the gold with the blackface sound as well. Just gotta spend some time breaking in the gold, but when you do, well worth it. Me too. That and the fAne creamback.